The National Cathedral Flower Mart is Washington, D.C.'s spring festival for garden enthusiasts and families that features annuals, perennials, landscape exhibits, Olmsted Woods and Garden tours, musical entertainment, gourmet food, a book sale, and children's activities such as a rock wall, moon bounce, a mini-Ferris wheel, and a century-old restored carousel. 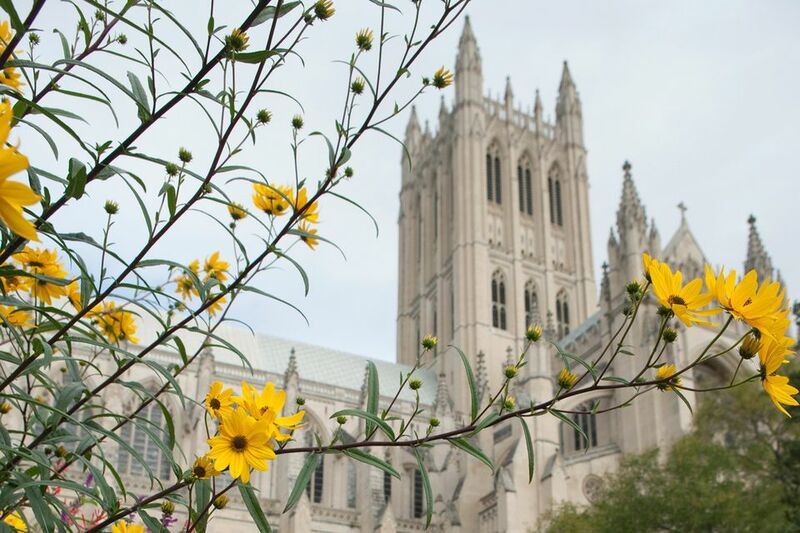 Held on the grounds of the Washington National Cathedral annually since 1939, the Flower Mart is sponsored by the volunteer organization All Hallows Guild and will take place on Friday, May 3 and Saturday, May 4, 2019, starting at 10 a.m. The festival encircles Washington National Cathedral with its tents and includes more than 80 booths offering gardening items, handbags, jewelry, and more. Additionally, embassies and international floral designers will be bringing an extraordinary display of floral arrangements to decorate the event space. The Flower Mart is also a part of Passport D.C, an annual celebration of international culture with tours of more than 70 embassies and hundreds of events including street festivals, performances, and exhibitions. As a special treat during the National Cathedral Flower Mart, the Washington National Cathedral invites attendees to climb to the top of the Cathedral's tower and see a spectacular full view of the day's festivities. This 333-step climb to the bell-ringing chamber gives you access to a view from 300 feet above the event. One of the most popular and unique attractions at the Flower Mart, the International Floral Exhibit lines the nave of the Cathedral with beautiful floral displays created by many of the city’s foreign embassies to showcase their countries’ native flowers, histories, and cultures. International embassies participating in 2018 include the Republic of Armenia, Bangladesh, Hong Kong Special Administration Region, India, Japan, Kazakhstan, Korea, Kyrgyzstan, Malaysia, Mongolia, Nepal, Philippines, Democratic Socialist Republic of Sri Lanka, Taiwan, and Turkey. Other highlights of the Flower Mart include the All Hallows Guild Centennial Tent, SUPER Premier Plants Booth, the 1890's Wooden Traveling Carousel, a Kid's Corner activity center, Tea in the Tower servings, and the Iron Florist Competition. The Mayor of the District of Columbia Muriel Bowser will also cut the ribbon to open the event. The Flower Mart is a great place for the whole family, featuring festive foods, children's rides, hand-crafted gifts, and thousands of flowers and herbs to see. Not only can you buy all sorts of flora for your home at Flower Mart, you and your kids can also learn about the history of the All Hallows Guild at the Centennial Tent or have a catered tea in the historic Cathedral Tower for individuals or groups. As the National Cathedral is located in northwest Washington, it can take a bit longer to get to than other popular destinations like the Washington Monument or the White House, but that also means you're more likely to find parking. Additionally, the closest Metro station is Cleveland Park and buses run by the Cathedral, so you can also access the grounds via public transportation.